Nurse.Fighter.Boy is well-meaning, well-crafted, and soulful. But it’s also tedious. 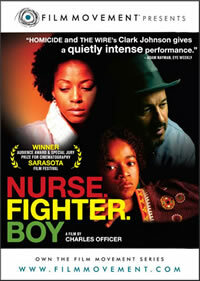 As the title implies, Nurse.Fighter.Boy weaves together the stories of three main characters. There’s Jude (Karen LeBlanc, Dolan’s Cadillac), a nurse ill with sickle cell anemia. At one point she tends to Silence (Clark Johnson, The Sentinel), a fighter who’s basically Toronto’s version of Rocky (ironically, Johnson was born in Philadelphia, Rocky’s hometown). And Jude has a loving, faithful, dedicated son, Ciel (Daniel J. Gordon, Mr. Magorium’s Wonder Emporium), who fills her life – and that of a neighbor friend – with music and magic. Nurse.Fighter.Boy excels at setting a tone and a vibe. There’s no denying the music selections are affecting and they certainly perk up the movie’s action. It’s interesting to note the preference for vinyl by both Silence and Ciel. After all these years, the dropping of a needle on vinyl is much sexier and evocative than a laser on a CD. But Nurse.Fighter.Boy struggles in holding interest. The main characters are so well-intentioned, they’re almost boring. Nurse.Fighter.Boy garnered a whopping 10 nominations at this year’s Genie Awards, the Canadian equivalent of the Oscars. The nominations were for best picture, direction, art direction, screenplay, acting (for both LeBlanc and Johnson), cinematography, original song, sound editing, and costume design. Even though it took home only the award for Best Original Song (Oh Love), it’s still quite a testament to the movie’s pedigree. Even so, the movie doesn’t really gather a full head of steam until well into the third act, when the inevitable life-altering occurs. To say what that event is would be a spoiler, but suffice it to say it is dramatic, well-presented, and the reactions ring true. Ringing true, though, is something the bulk of the movie fails to do. It’s hard to buy into the romance between Silence and Jude. It’s also hard to buy into the purity of Ciel; he washes his mom’s back while she bathes and they have heart-to-heart chats, for Pete’s sake. That’s not likely for a boy his age. In terms of supplemental material directly related to Nurse.Fighter.Boy, this disc is pretty bare bones. The most interesting inclusion are the liner notes, which include some particular helpful and insightful comments from Charles Officer. The disc also includes biographies of select cast and crew plus the Nurse.Fighter.Boy trailer. There are also trailers from six other movies in the Film Movement catalog. The interesting part of Film Movement’s approach is to include a short film that complements the feature film’s themes. In this case, Afterglow is a 16-minute Swiss short about a different broken family, one that is desperately trying to cope with the death of a man who was a father, husband, and brother. It’s atmospheric and suitably matches the underlying message of Nurse.Fighter.Boy. For more information about Film Movement’s DVD club, check out their site, FilmMovement.com. This DVD doesn’t seem to be a proper presentation of Steve Cosens’ Genie-nominated cinematography. This might be an issue with the source material and a limitation of the DVD format, though. Some scenes come across nicely, but others are a tad murky. The audio fares much better. The 5.1 Surround track is excellent, but there’s also an optional stereo track for those so inclined. Watch Afterglow to set the mood then tackle Nurse.Fighter.Boy.